Nintendo has revealed a series of games for Nintendo Switch, the company's new hybrid video game console, at a dramatic presentation event streamed live from Tokyo, Japan. The event, which was watched by a series of journalists both in Tokyo and from around the world, expanded on the Nintendo Switch's hardware reveal in 2016, with new information about the console and its controllers released, as well as its coming software library. Nintendo Switch will have an online service that will be paid for after an introductory period, while it was also confirmed region locking will not be present on the console, allowing users to play games from all territories on their system. The Nintendo Switch will offer three different play styles. Play styles include TV mode, Tabletop mode (with kickstand), and Handheld mode (attach Joy-Con controller). When not in TV mode, battery life will vary from game to game, however will sit somewhere between 2.5 - 6 hours. In addition, users can continue to play while the system is charging via USB Type-C play while charge functionality. 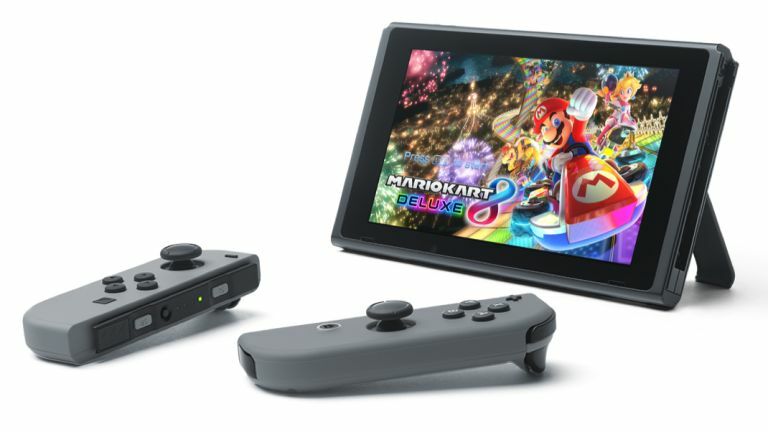 The Nintendo Switch has a capacitive touch panel, a unique Joy-Con controller with Wii-style strap for motion control (multiple colours available) and it has been confirmed that up to 8 systems can be connected locally via Wi-Fi for multiplayer gaming, as well as online multiplayer with gamers around the world. HD rumble is a feature of the Joy-Con, giving new sensing and vibration technologies. UK retailer Game is listing the Switch for a pre-order price of £279.99. 1-2 Switch is a new game that can be played without looking at any screen, offering a series of games designed to let people play together. One game was quick draw dueling game set in the Wild West. It launches March 3. Arms is a new game that is like boxing and shooting combined, with players using the Joy-Con in each hand to send their springy boxing gloves forward to strike the opponent. By tilting the Joy-Con controllers, you can move your own character to avoid being struck. Online battles are confirmed and the game launches Spring 2017. Splatoon 2 is a sequel to the Wii U game, Splatoon. New weapons, special weapons and battle stages have been confirmed. Both the Joy-Con and the Pro Controller can be used, while when playing with the Joy-Con, motion controls can be used to fire. Local and online multiplayer is confirmed. Launches summer 2017. Super Mario Odyssey is a brand new Super Mario game. It is the first time since Super Mario 64 and Super Mario Galaxy that an open-world game has been made. Mario visits a series of unique worlds in the game, which is launching in the holiday season 2017. Xenoblade 2 is coming, however no details were given. A series of Dragon Quest games also and a Fire Emblem title called Fire Emblem Warriors. Shin Megami Tensei also gets a new title and a new old-style JRPG from Square-Enix are also heading to Nintendo Switch. Skyrim is indeed coming to the Nintendo Switch, which can be played remotely while on the go for the first time. EA Sports Fifa has also been confirmed as coming to the Nintendo Switch in 2017, however no other details were given. And finally, Legend of Zelda: Breath of the Wild is launching alongside the Nintendo Switch on March 3, 2017. Two versions of the Nintendo Switch will be sold at launch, one sporting a grey Joy-Con controller and the other sporting a red and blue version. Each package includes a Nintendo Switch, Joy-Con controller, Nintendo Switch dock, Joy-Con straps and HDMI cable. Nintendo Switch, formerly code-named the 'NX', is Nintendo's new videogame console to rival PS4 and Xbox One. Switch, which is set to follow the 2012-launched Wii U, follows the Japanese firm's tradition of innovation in the gaming hardware market by creating an experience that combines a home console with a handheld. The game's main console comes with a Switch Dock, a device which contains a portable, tablet-like screen. When at home, you simply slip the screen into the dock and game on your TV as normal. Should you want to move away from your TV and your home, all you need to do is detach two of the components in your official Nintendo Switch Joy-Con pad, slip them onto either of the screen in your Switch Dock and voila - you've gone portable. Best of all, your game will disappear from your TV and appear instantly on your new gamepad, exactly as you left it. Nintendo has seemingly combined a next-gen home console with its long experience in the handheld market and created something truly unique. Nintendo has already confirmed Switch will launch in March 2017 — the company skipped showing the console at E3 and instead opted to show the only confirmed launch game for the console, The Legend of Zelda: Breath of the Wild, which will come to Switch and Wii U on the same day. First off, the Switch Dock seen in the reveal trailer is NOT the main console - Nintendo has already had to officially clarify this, so technically we haven't scene what the main unit looks like. But, considering how low-key the Wii U's base unit was compared to its show-stealing GamePad, we're not expecting PS4-style artistry. Alongside the mystery base unit, there's the aforementioned Switch Dock - its basically a peripheral that serves as a holding dock for a tablet-like gamescreen (think the Wii U's GamePad only a lot slimmer). We don't know if the Switch Dock will be a charging station, but it seems almost certain it will be. As to how much charge said dock will give the portable Switch remains to be seen. In order to take that screen portable, you'll need the Joy-Con controller. Coming in two versions, a Pro Controller (which is very similar to the Pro version made for Wii U) and a modular version where you can detach each half of the pad. These two sections of the Joy-Pad can either be slipped onto either side of the screen in the Switch Dock, enabling you to take your game anywhere you want, or used as separate controllers for two-player co-op. The two Joy-Con components can also be used with the gamepad while unattached, similar to the way you'd use a Wii Remote with the original Wii. There's no word yet on whether these components will have motion controllers, but considering motion controls have played a big part in Nintendo hardware for years, there's certainly a good chance we'll see it feature in some capacity in Switch. There's no word on how powerful Switch will be in terms of processing power, and Nintendo has often favoured innovation in terms of shooting for bleeding edge graphics and performance so don't be too shocked if Switch isn't as powerful as PS Pro or the mysterious Project Scorpio from Microsoft. However, a lot of big studios have officially been confirmed to be working on Switch based games, be they multiformat titles or exclusive ones, so clearly Switch has something to offer in the performance and graphics stakes. Nintendo may be keeping most of its hardware stats under wraps, but we do know that Switch will be powered by a bespoke version of Nvidia's Tegra X1 chip (which also powers the company's Shield console). Things get a little more complicated as the X1 powering the Shield uses is 'passively cooled' — this means parts of the hardware that don't move will direct heat away from the processor of the unit. However according to Digital Foundry the development kits for the NX are 'actively cooled' which means that the processor powering Nintendo's latest piece of hardware is running at a faster configuration than what's currently on the market. Our only concern is the fact the X1 was designed for use with mobile devices, so it isn't as powerful as what's running inside PS4 and Xbox One, but considering we've only seen dev kits so far, there's still plenty of room for Nintendo to max out its specs for Switch. We love Wii U here at T3, but there's no denying that Nintendo hasn't offered enough games for the system to justify the upgrade from Wii. While we know hardly any of the games coming to the platform for sure, it's clear Nintendo needs to ensure its new console launches with a strong line up and continues to offer both multiplatform and first-party titles going forward. So what games do we know about for sure? Well, as of writing, only The Legend of Zelda: Breath of the Wild has been confirmed with a dual release on Switch and Wii U. Sources have also alluded to a new Smash Brothers and a new Mario being in development (with the brief footage glimpsed in the trailer seemingly confirming this). Said trailer also seemingly confirmed the presence of The Elder Scrolls V: Skyrim Special Edition. Bizarrely, developer Bethesda hasn't confirmed the game is coming to Switch yet, but this is likely just a PR formality. Dragons on Switch! Ah, now this is important. The last pieces of information on that leaked survey indicated that Nintendo NX users could “connect with other Nintendo players around the world via the Nintendo Network” and “earn and share gaming achievements, triumphs and defeats with your gaming friends and the Nintendo gaming community”. Now, on the face of it, this sounds pretty familiar to the functionality that the Wii U / 3DS has offered this generation. However, when you factor in the news that in 2014 Nintendo dropped a cool $150 million on a non-gaming technology company, in 2015 announced a partnership with Japanese mobile developer DeNA, and in 2016 released its first ever mobile app, Miitomo, which went on to scoop up more than three million users in just 24 hours, then a shift toward cross-platform/device software becomes clear. Nintendo has also gone through pains to unify its Nintendo Network and Nintendo eShop accounts across its devices, while the new smartphone Miitomo app encourages you to link your account into it too. The Nintendo NX will take this to the next level, with its OS and software designed from the ground up to link into apps, games and software that exist on other devices. So who has Nintendo got working on Switch? Well, following Iwata's passing, Nintendo created two new positions in the company: Creative Fellow and Technology Fellow. These positions are filled by legendary games creator Shigeru Miyamoto (responsible for the creation of Mario, Donkey Kong and the Legend of Zelda) and console design wizard Genyo Takeda. Both of these figures are working on the Nintendo NX, as well as various other projects involving the long-term future of the Nintendo. Tatsumi Kimishima, the current Nintendo president, has also confirmed that Hideki Konno and Yoshiaki Koizumi are both working on the Nintendo NX. Konno is currently development head of Nintendo EAD Software Development Group No.1 (so the best of the best at Nintendo) and has previously directed the original Super Mario Kart, Super Mario World 2: Yoshi's Island, F-Zero X, Luigi's Mansion and The Legend of Zelda: The Wind Waker. Koizumi, the guy who directed Super Mario Galaxy, produced Super Mario 3D World and worked on basically every Zelda game since 1991, is currently working on undisclosed projects at Nintendo's head office in Tokyo, Japan. Basically, there is the crème de la crème of Nintendo software and hardware development working on the Nintendo NX and that is something to really get excited about. While the three-minute reveal trailer managed to get even the biggest Nintendo nay-sayers hot under the collar, there are still plenty of unanswered questions surrounding the new system. What kind of battery life will it have? - This is a biggie. With Nintendo unifying its console and handheld development into one unit, its going to have to address the sheer amount of power a portable device running the likes of Breath of the Wild is going to eat up. A few hours at full capacity is not going to cut it, and considering how the issue of battery life affected Pokemon Go on mobiles, Nintendo knows Switch needs to hold up in this department. Will Switch have substantial third-party support? - This aspect was one of the main reasons Wii U died the death it did. Without significant third-party support, a modern videogame console is dead in the water. Even with first-party properties as recognisable as Mario, Smash Bros and Zelda, Switch needs the likes of FIFA, CoD and Madden to cement itself with the game buying mainstream. Will it be backwards compatible? - This generation has proved one thing for sure - gamers love being able to play the games they used to love on their new hardware. Xbox One became a lot more palatable when the ability to play Xbox 360 games was introduced, and Nintendo itself has had plenty of success with Virtual Console on Wii U and 3DS. Considering Switch will have a portable screen a la Wii U, and be a handheld console, crossing over with 3DS seems like a must. Motion controls and touchscreen - The reveal trailer, the accompanying press release and the occasional official clarification still haven't addressed two important issues: will Switch support motion controls and will the portable gamepad have a touchscreen? At this stage, not having a touchscreen seems like lunacy considering simply emulating a tablet will make Switch more attractive to new adopters. It's telling that no such functionality was shown off in the reveal, and its absence could seriously date the hardware from the off. Will it support amiibo? - Almost certainly, yes. Amiibo have proved a huge hit with Nintendo fans and toy collectors alike, and with their NFC features for Wii U an 3DS, including such a feature with Switch is a no brainer. We would like to see the content provided by an amiibo improved though - it's time for new areas and extra content. Update: The latest leaks, from Dutch blog site TechTastic suggests the Switch is going to be priced at €250 and also revealed the UK retailer Game is going to have the system on shelves for £200. If this is true, it's going to undercut both PlayStation 4 and Xbox One significantly, and have the unique selling point of portability to boot. Rumours are also stating there could be a higher priced version of the system that comes in at £250 that includes more storage and an included game. Nintendo never sells software cheaply either, so just like previous console generations, you'll be seeing games come out at high prices and then hold their value for a very long time — so make sure you've got enough saved for March 2017.